George Clooney plays an unusually befuddled character in The Descendants, the Closing Night film at the 2011 New York Film Festival (NYFF), and also a featured screening at the 2011 Hamptons International Film Festival (the same weekend)! Returning home from a more-or-less perpetual business trip because his wife fell into a coma after a boating accident, Clooney must deal with two daughters who are somewhat alien to him, the fate of his wife, and a big decision on how to divest a huge parcel of spectacular, pristine Hawaiian landscape that he is heir to and, most important, the custodian for -- on behalf of his extended family of relatives. 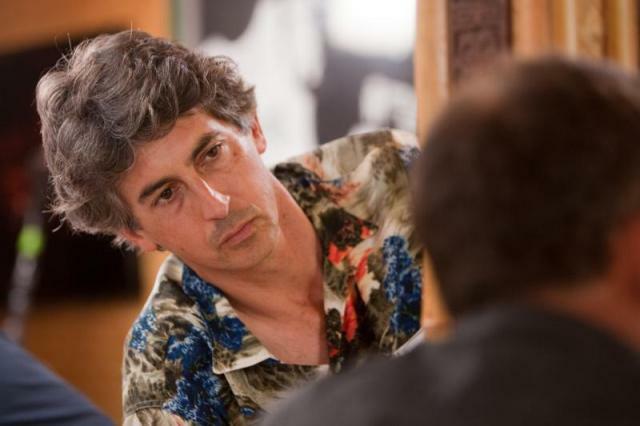 Director Alexander Payne's camera and direction take us into the private as well as the lush Hawaii. From L to R- Shailene Woodley as "Alexandra,"
George Clooney as "Matt King,"
and Nick Krause as "Sid"
Judy Greer is emotionally affecting in her climactic scenes, George Clooney is terrific from beginning to end, and even his comatose wife is convincing, without moving or saying a word. It's funny, but in a film like this, which revolves in part around a silent, motionless woman, it is her presence which determines whether the film can succeed, for she must be believable as the someone who can be at the center of of attention. And Robert Forster, as the aggrieved father of the comatose wife, mother, and daughter, adds punch. As the Press Photographers get a little wild. A note about 3D video on YouTube. It should start as a 3D video for Red/Cyan glasses. If it does not, or if you prefer one of the other viewing methods, follow the instructions to change the 3D viewing method. Sometimes it requires a few tries before YouTube kicks in with the correct format. QPORIT 3D videos on YouTube SHOULD BE ABLE TO BE VIEWED IN ANY OF THE FOLLOWING FORMATS: (but as mentioned above, the current state of the art is that it may take a few tries to change the format). 5 - Using the NVIDIA 3D system for a computer.